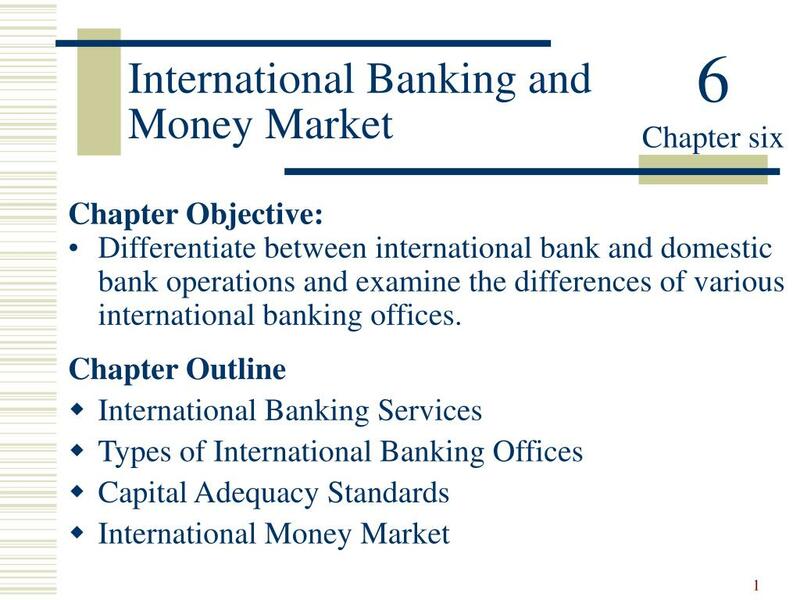 Differentiate between international bank and domestic bank operations and examine the differences of various international banking offices. 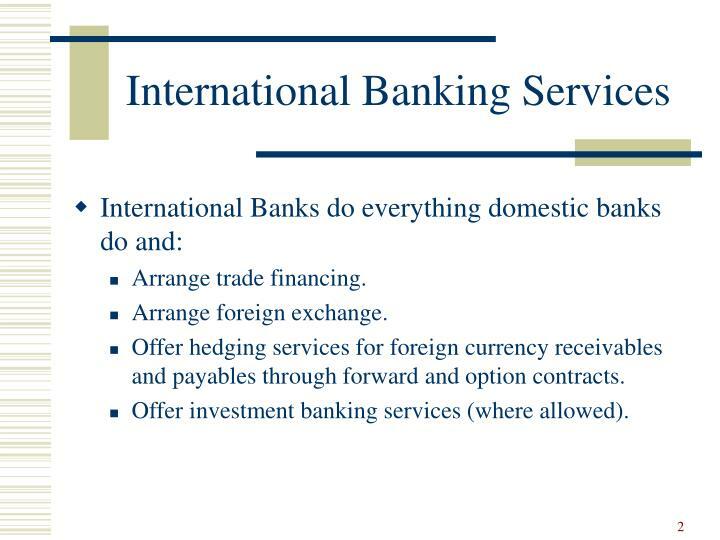 Offer hedging services for foreign currency receivables and payables through forward and option contracts. 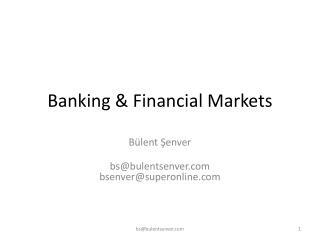 Offer investment banking services (where allowed). 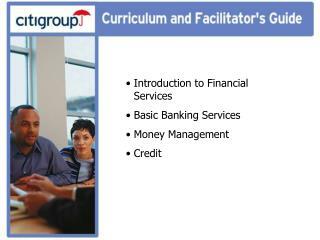 Provides a means for a bank’s MNC clients to conduct business worldwide through his local bank or its contacts. 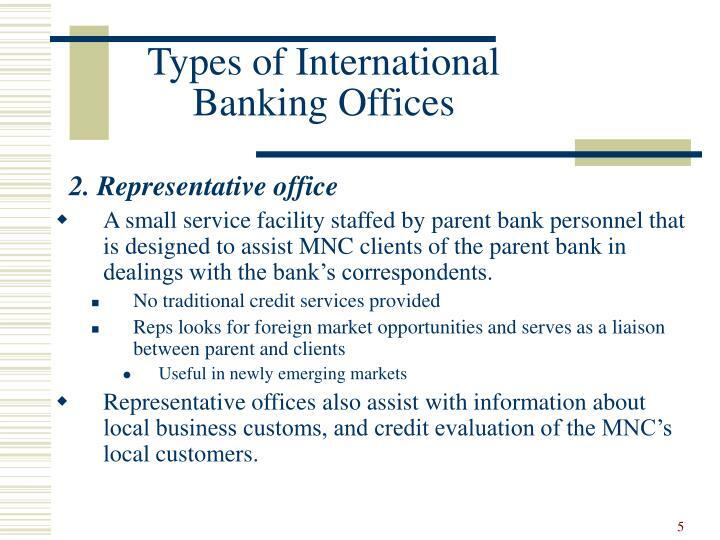 A small service facility staffed by parent bank personnel that is designed to assist MNC clients of the parent bank in dealings with the bank’s correspondents. Representative offices also assist with information about local business customs, and credit evaluation of the MNC’s local customers. 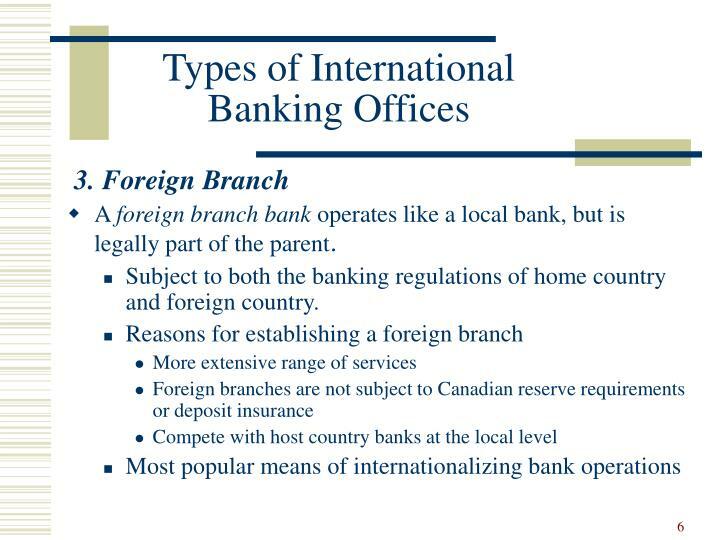 A foreign branch bank operates like a local bank, but is legally part of the parent. 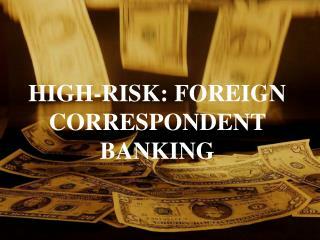 Subject to both the banking regulations of home country and foreign country. 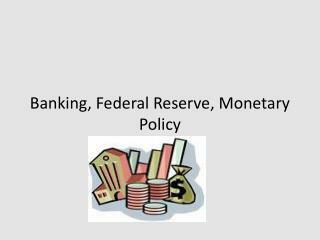 A subsidiary bank is a locally incorporated bank that is either wholly owned or owned in major part by a foreign parents. 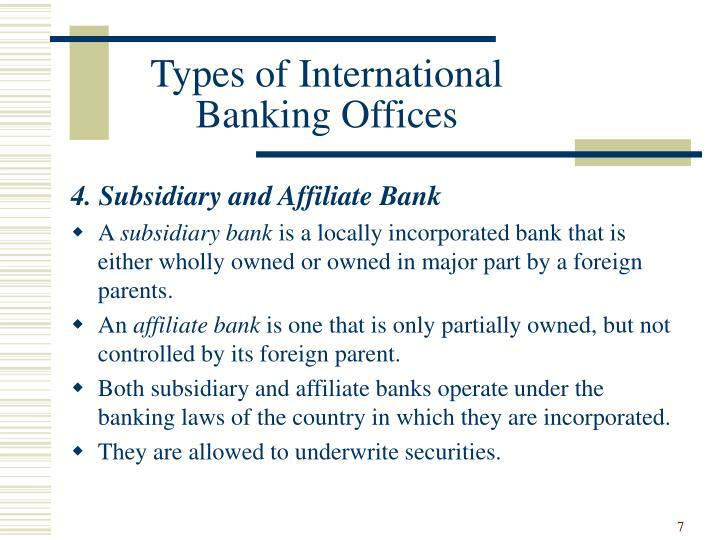 An affiliate bank is one that is only partially owned, but not controlled by its foreign parent. 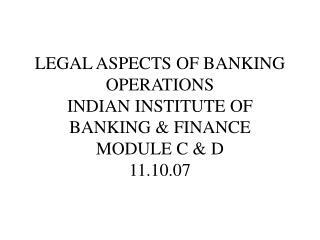 Both subsidiary and affiliate banks operate under the banking laws of the country in which they are incorporated. 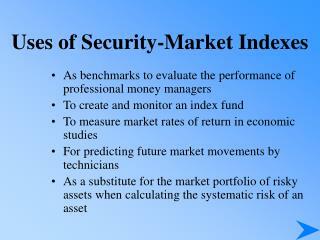 They are allowed to underwrite securities. 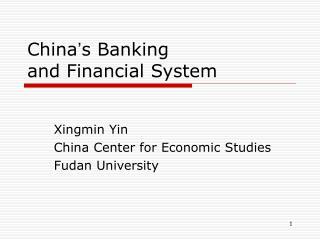 A country whose banking system is organized to permit external accounts beyond the normal scope of local economic activity. 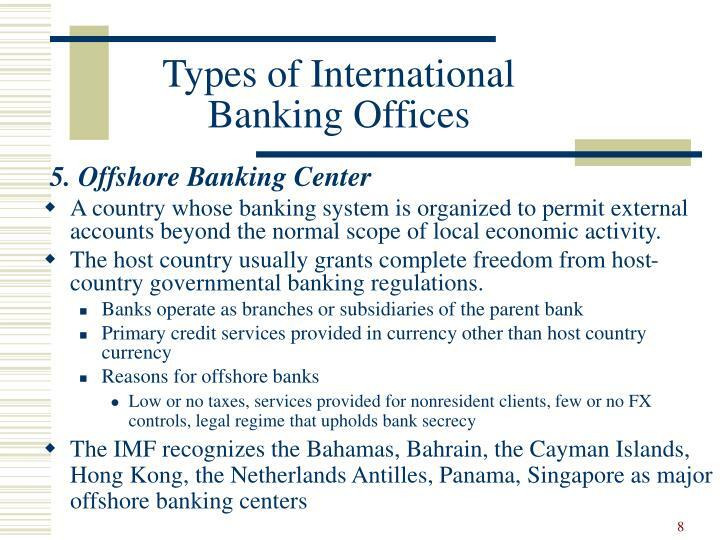 The host country usually grants complete freedom from host-country governmental banking regulations. 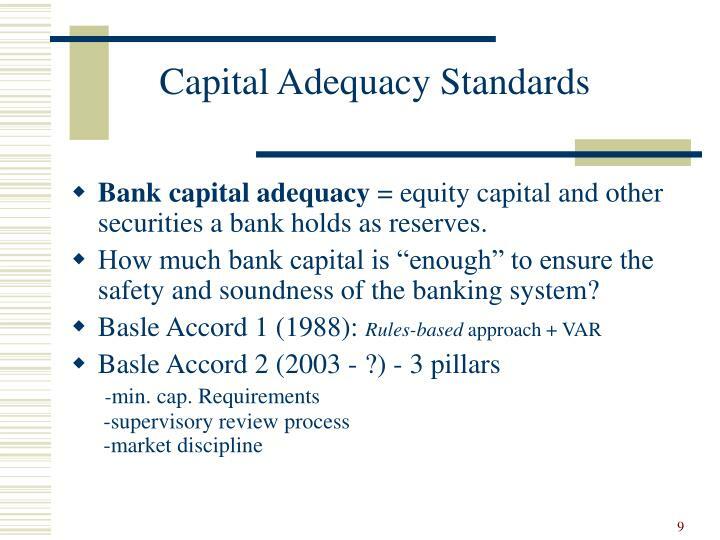 Bank capital adequacy = equity capital and other securities a bank holds as reserves. 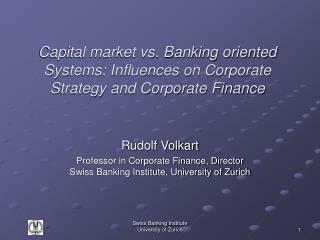 How much bank capital is “enough” to ensure the safety and soundness of the banking system? Banks involved in cross-border transactions. 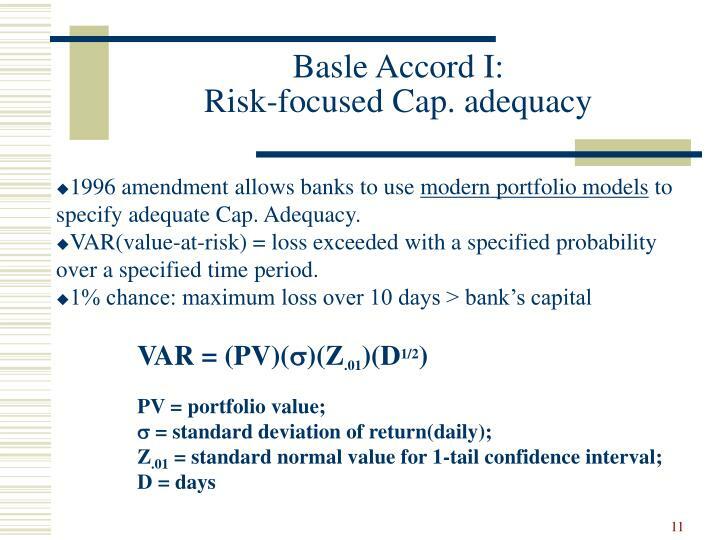 1996 amendment allows banks to use modern portfolio models to specify adequate Cap. Adequacy. VAR(value-at-risk) = loss exceeded with a specified probability over a specified time period. 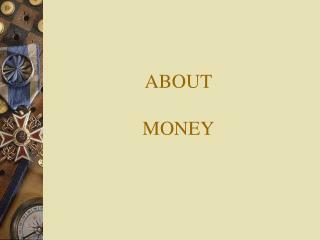 Eurocurrency is a time deposit in an international bank located in a country different than the country that issued the currency. Eurodollars are U.S. dollar-denominated time deposits in banks located outside the United States. 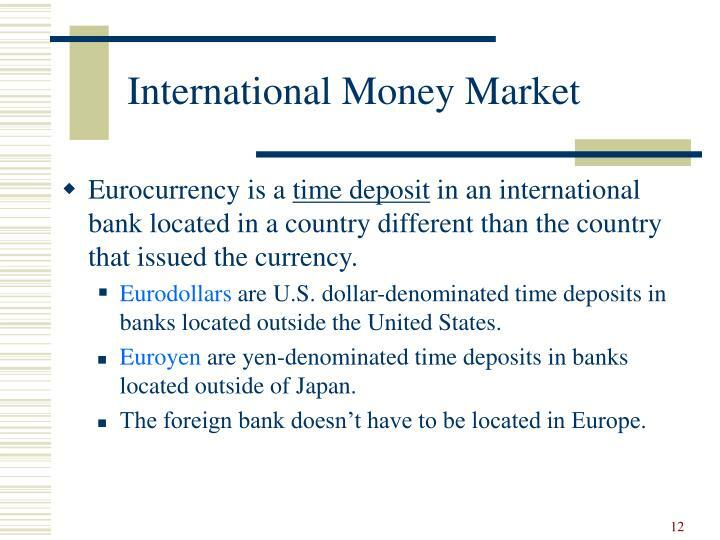 Euroyen are yen-denominated time deposits in banks located outside of Japan. 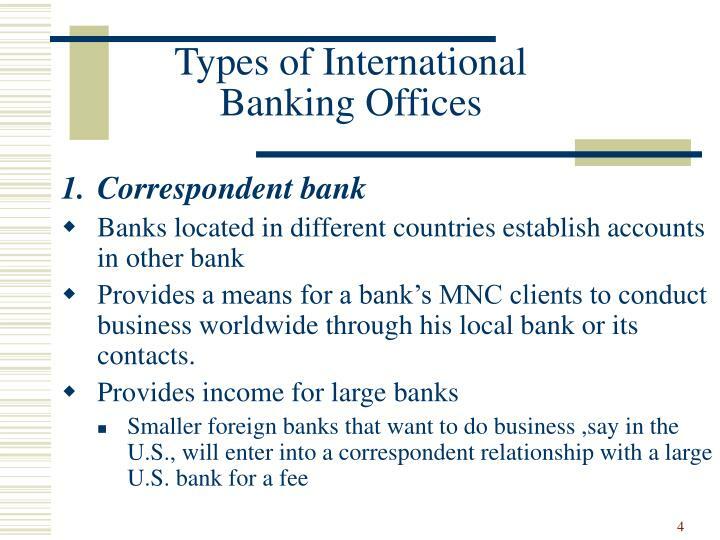 The foreign bank doesn’t have to be located in Europe. 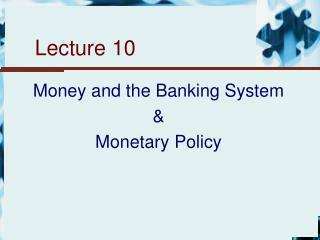 This is an external banking system that runs parallel to the domestic banking system. Banks seek deposits and make loans to other Eurobanks. - loan interest rate is the interbank offered rate. 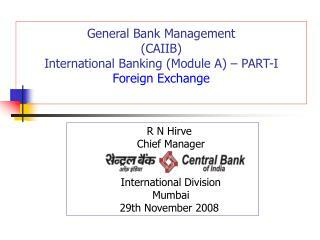 - interbank deposit interest rate is the interbank bid rate. Rapid growth, especially in the Eurodollar market. 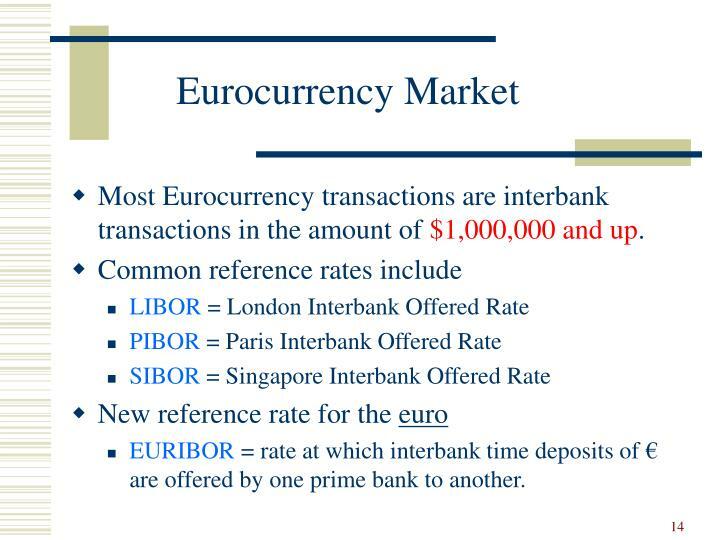 Most Eurocurrency transactions are interbank transactions in the amount of $1,000,000 and up. 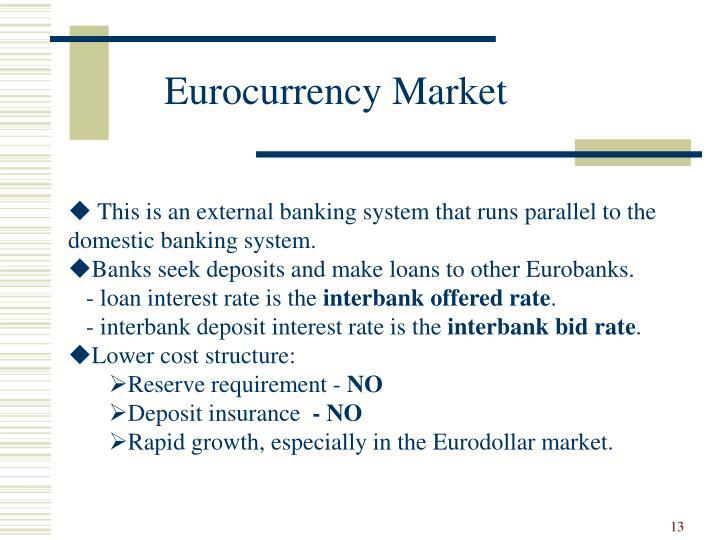 EURIBOR = rate at which interbank time deposits of € are offered by one prime bank to another. 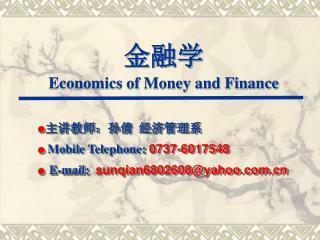 Short- to medium-term loans of Eurocurrency to corporations, governments, nonprime banks or international organizations. 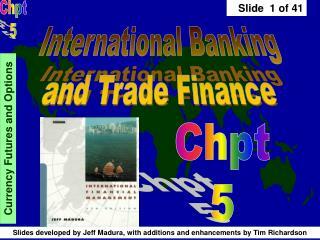 Loans are often too large for one bank to underwrite; a syndicate of banks share the risk of the loan. 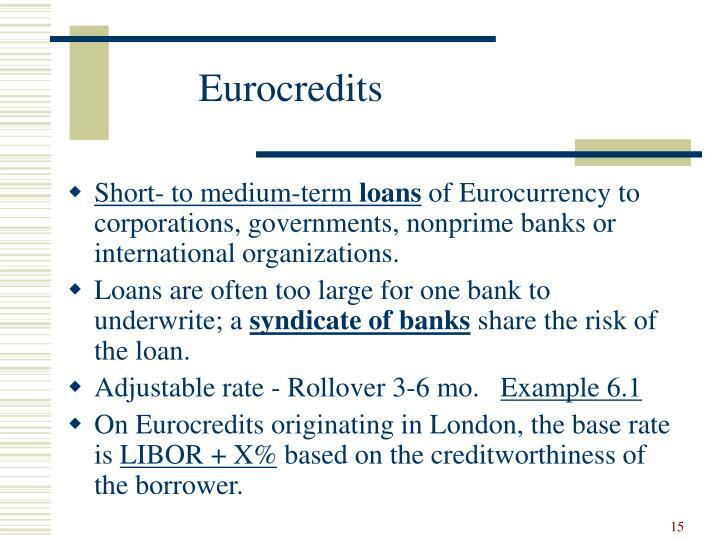 On Eurocredits originating in London, the base rate is LIBOR + X% based on the creditworthiness of the borrower. 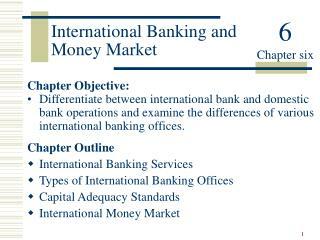 An interbank contract that involves two parties, a buyer and a seller. The buyer agrees to pay the seller the increased interest cost on a notional amount if interest rates fall below an agreed rate. 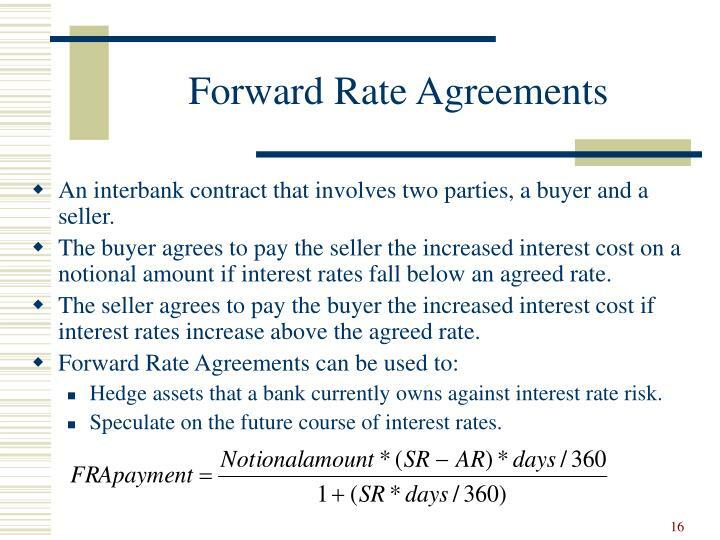 The seller agrees to pay the buyer the increased interest cost if interest rates increase above the agreed rate. 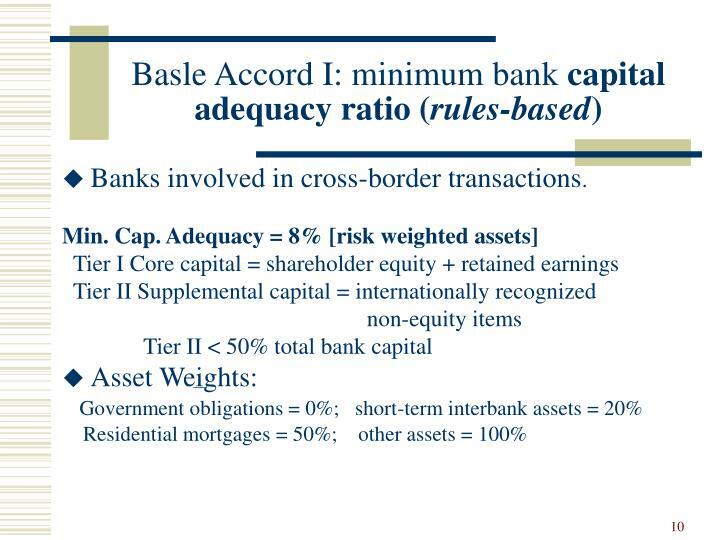 Hedge assets that a bank currently owns against interest rate risk. 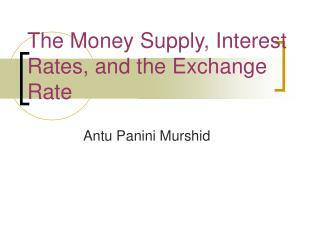 Speculate on the future course of interest rates. They are sold at a discount from face value and pay back the full face value at maturity. 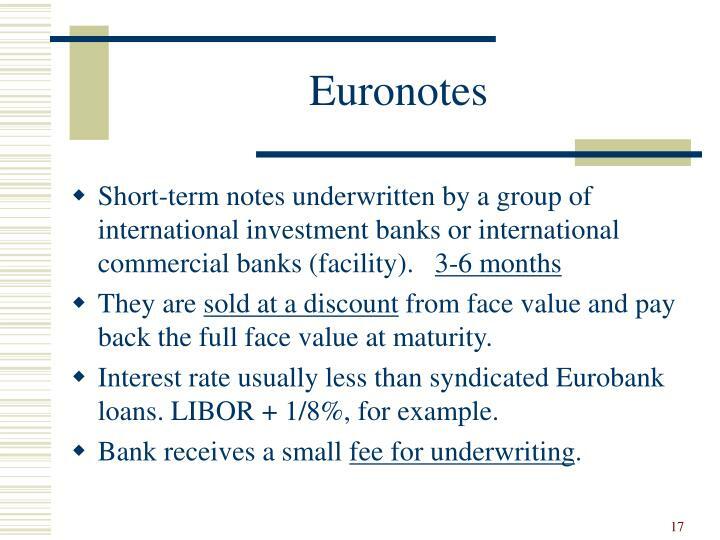 Interest rate usually less than syndicated Eurobank loans. LIBOR + 1/8%, for example. Bank receives a small fee for underwriting. 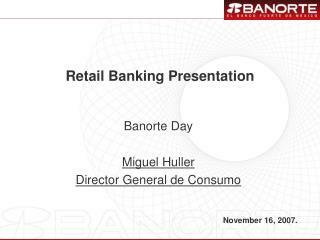 Unsecured short-term promissory notes issued by corporations and banks. 1-6 months. Placed directly with the public through a dealer. 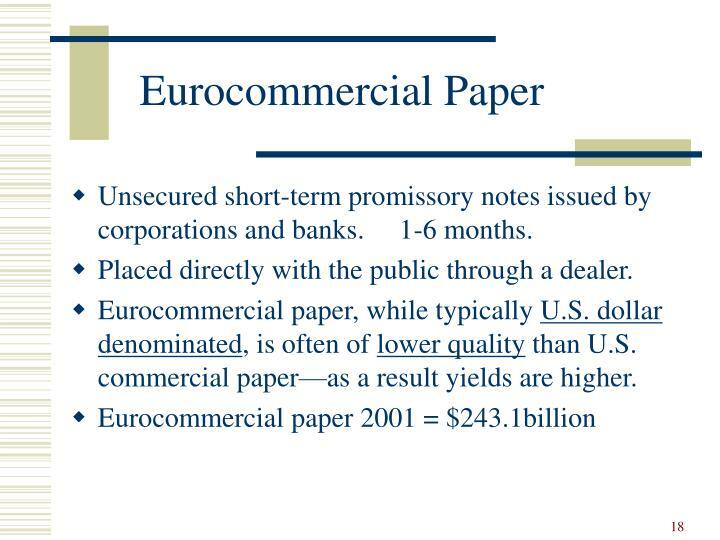 Eurocommercial paper, while typically U.S. dollar denominated, is often of lower quality than U.S. commercial paper—as a result yields are higher. Some of the largest banks in the world were endangered when loans to sovereign governments of some less-developed countries. 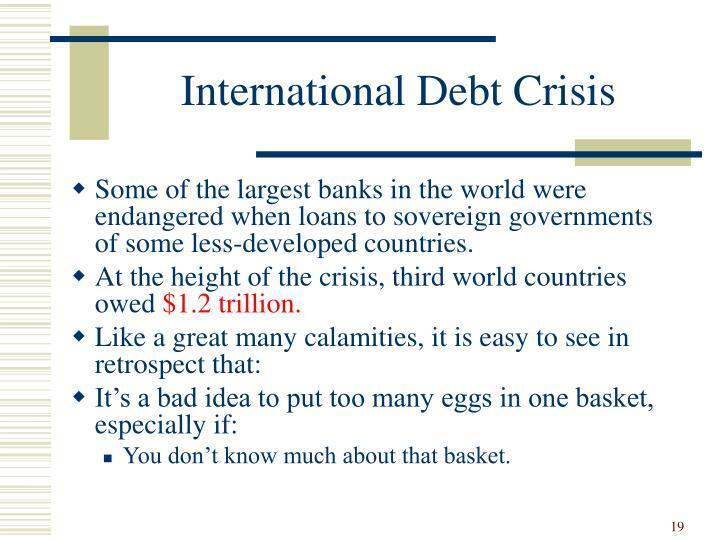 At the height of the crisis, third world countries owed $1.2 trillion. You don’t know much about that basket. 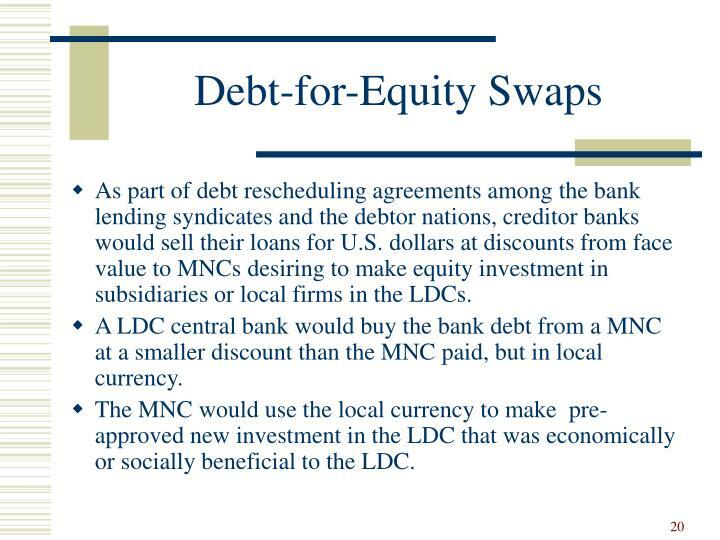 As part of debt rescheduling agreements among the bank lending syndicates and the debtor nations, creditor banks would sell their loans for U.S. dollars at discounts from face value to MNCs desiring to make equity investment in subsidiaries or local firms in the LDCs. 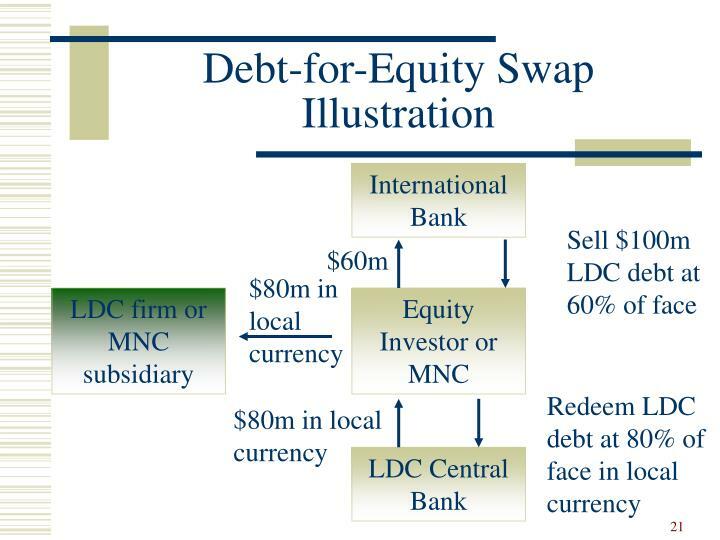 A LDC central bank would buy the bank debt from a MNC at a smaller discount than the MNC paid, but in local currency. The MNC would use the local currency to make pre-approved new investment in the LDC that was economically or socially beneficial to the LDC. 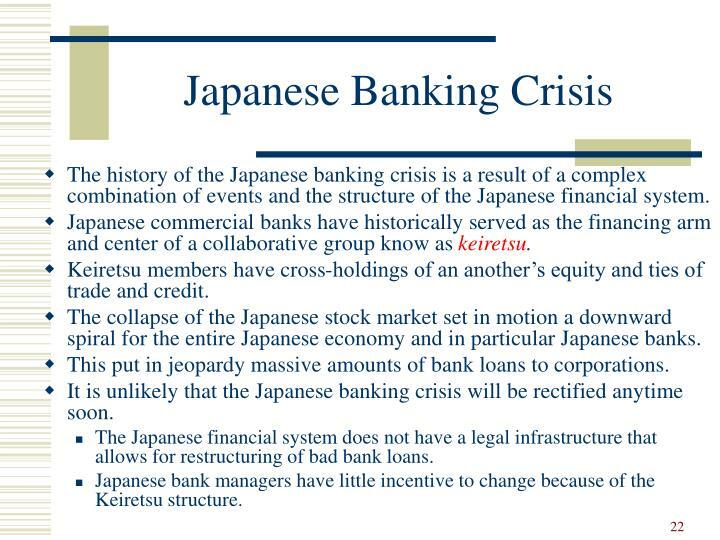 The history of the Japanese banking crisis is a result of a complex combination of events and the structure of the Japanese financial system. 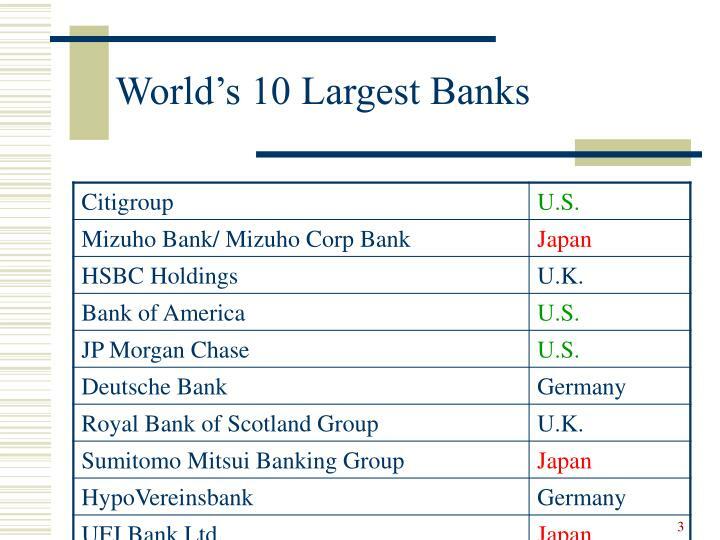 Japanese commercial banks have historically served as the financing arm and center of a collaborative group know as keiretsu. 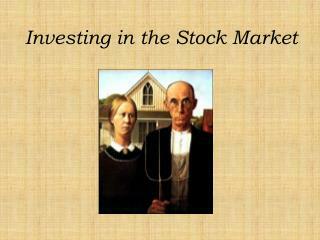 Keiretsu members have cross-holdings of an another’s equity and ties of trade and credit. The collapse of the Japanese stock market set in motion a downward spiral for the entire Japanese economy and in particular Japanese banks. This put in jeopardy massive amounts of bank loans to corporations. It is unlikely that the Japanese banking crisis will be rectified anytime soon. 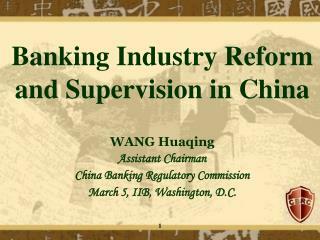 The Japanese financial system does not have a legal infrastructure that allows for restructuring of bad bank loans. Japanese bank managers have little incentive to change because of the Keiretsu structure. This crisis followed a period of economic expansion in the region financed by record private capital inflows. Bankers from the G-10 countries actively sought to finance the growth opportunities in Asia by providing businesses with a full range of products and services. This led to domestic price bubbles in East Asia, particularly in real estate. 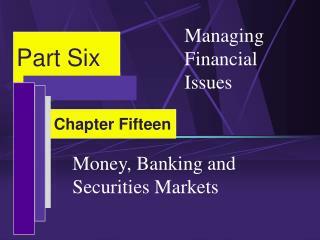 Additionally, the close interrelationships common among commercial firms and financial institutions in Asia resulted in poor investment decision making. 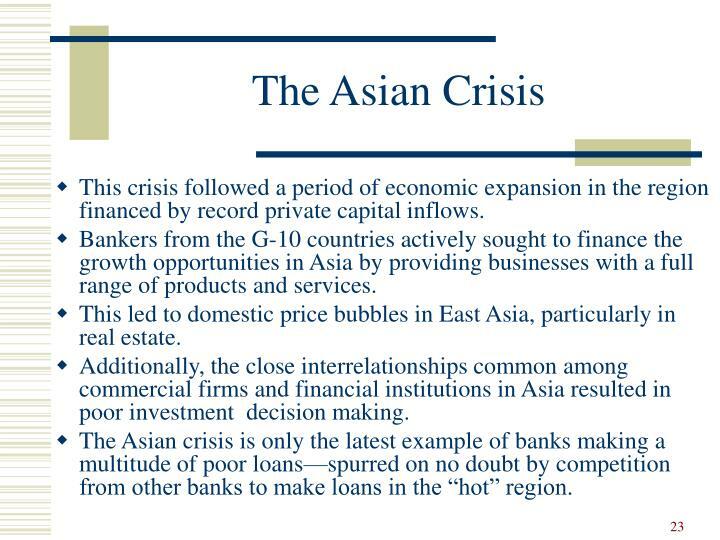 The Asian crisis is only the latest example of banks making a multitude of poor loans—spurred on no doubt by competition from other banks to make loans in the “hot” region.